a new version of SimSketch has just been uploaded. Besides a few small bug fixes, this version comes with a new behavior called ‘infection’. 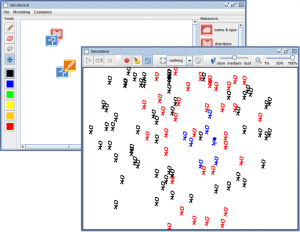 This behavior simulation the spreading of a disease, going through the stages ‘healthy’, ‘ill’ (objects are painted red) and ‘immune’ (objects are blue). Properties of the infection can be modified (e.g. the probability to catch the infection, the duration of the disease etc.) to investigate variation in an epidemic. Choose the ‘infection’ example from the menu for a quick start! As usual, SimSketch can be started via webstart here or by clicking the screenshot below.